^ Apollinaris of Laodicea (1904). 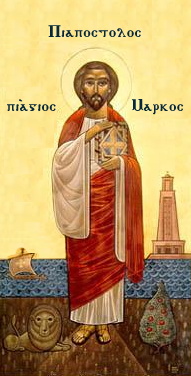 "Πρὸς Ἰοβιανόν". In Lietzmann, Hans. Apollinaris von Laodicea und seine Schule: Texte und Untersuchungen (in German and Greek). Mohr Siebeck Verlag. p. 251. 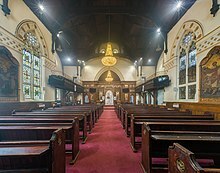 ^ a b c "Saint George Coptic Church". Suscopts.org. Retrieved 2014-04-03. 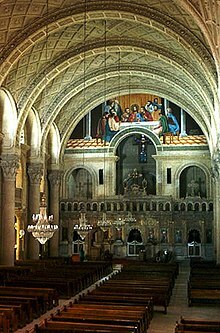 ^ "Pastoral Agreement between the Coptic Orthodox and Greek Orthodox Patriarchates of Alexandria". Orthodox Unity (Orthodox Joint Commission). 2001. Retrieved 2019-03-14. 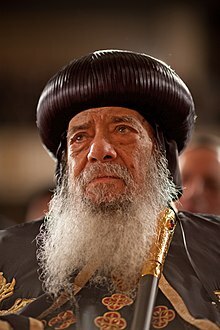 ^ "Egypt's Coptic Bishop Morcos: We need to build 4,000 churches in next 10 years". english.alarabiya.net. Retrieved 2018-02-02. ^ "The Coptic Orthodox Church in action – Al-Ahram Weekly". weekly.ahram.org.eg. Retrieved 2016-05-06. ^ Cairo, Jared Malsin in (2015-02-20). "'We want our sons back': fears grow for Egyptians missing in Libya". the Guardian. Retrieved 2016-05-06. ^ "Egypt must help its poor in response to Libya beheadings, economists say". america.aljazeera.com. Retrieved 2016-05-06. ^ "Egypt's Sisi meets world Evangelical churches delegation in Cairo - Politics - Egypt - Ahram Online". english.ahram.org.eg. Retrieved 2017-12-26. 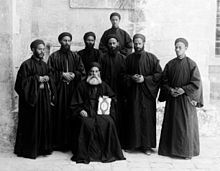 ^ "What is the Coptic Church?". BBC Religion & Ethics. 2012-11-02. Retrieved 2018-05-08. ^ Hassan, Abdel Salaam (1995). "The Copts" (PDF). In Verney, Peter. Sudan: Conflict and minorities. Minority Rights Group International. p. 26. Retrieved 5 April 2016. ^ Zaki, Moheb (May 18, 2010). "Egypt's Persecuted Christians". The Wall Street Journal. Retrieved June 4, 2010. ^ United States. Congress. Commission on Security and Cooperation in Europe (July 18, 2012). Escalating Violence Against Coptic Women and Girls: Will the New Egypt be More Dangerous than the Old? : Hearing before the Commission on Security and Cooperation in Europe, One Hundred Twelfth Congress, Second Session, July 18, 2012. Washington, DC: Government Printing Office. Retrieved 8 March 2015. 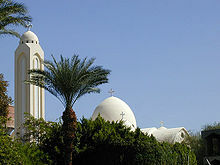 ^ "Saint Antony Coptic Orthodox Monastery". 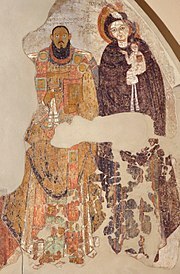 www.stantonymonastery.org. Retrieved 2015-09-06.